The Moon Base was the command post of Earthguard. It was established by the Hierarchy after the 2134 subjugation of Earth and was left under the command of Ilwrath and Spathi forces. After the Ur-Quan Kzer-Za and Ilwrath pulled out of the system, the Spathi withdrew their forces from Luna to Mars, then to Ganymede, later to Titan, and finally to Pluto. 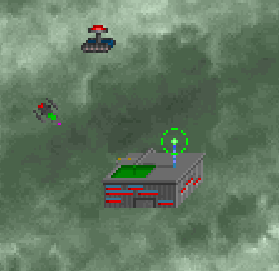 In order to prevent the Humans from learning about their cowardice, the Spathi carefully rigged an automated system to make the Luna base continue to appear active, constantly running the base's life-support systems, programming construction robots to move dirt and rocks around, and constantly broadcasting "Winky's Happy Night", a Melnorme FunRom, over transmission channels to simulate radio chatter. A Lander from The Flagship investigates the Moon Base on Luna while a Brainbox Bulldozer pushes sand. The ruse was successful, keeping the few Humans on the Starbase intensely worried about the Earthguard until The Captain finally came along in The Flagship, proposing an alliance to resume resistance against the Kzer-Za. Intrigued but fearing the potential consequences of failure, Starbase Commander Hayes asked The Captain to prove the power of his Precursor technology and his own prowess as a commander by removing the imminent Earthguard threat. The Captain sent a team that duly investigated the Luna base and found it abandoned, scrapping and salvaging most of its useful equipment and returning to The Flagship. Discovering there was no immediate threat from the Hierarchy, Hayes' mind was slightly put at ease, but he only put his full confidence in The Captain and agreed to support his New Alliance of Free Stars after The Captain later proved his worth in real combat by engaging and destroying a weakened Ilwrath Avenger that came to check on the Starbase. By most accounts, Luna was the first world to be liberated from Hierarchy rule. This page was last edited on 18 July 2015, at 18:32.